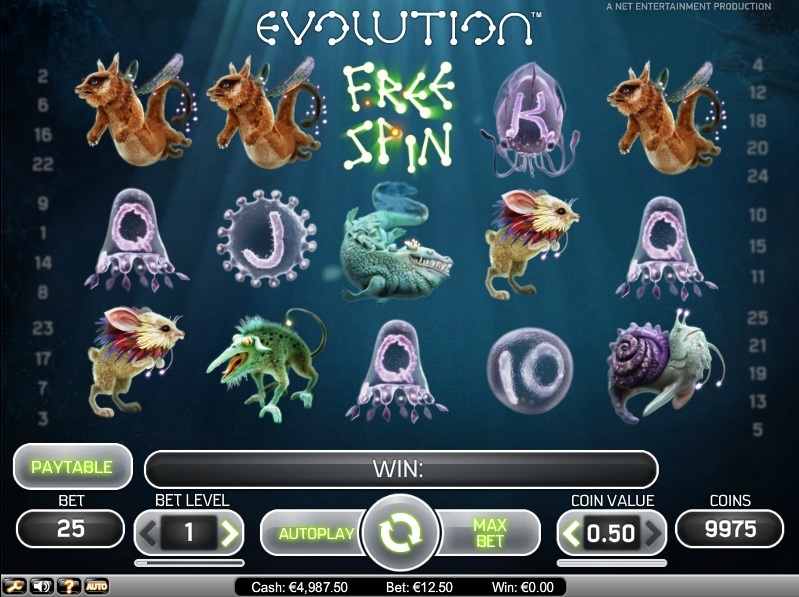 Evolution is online casino software developer NetEnt’s effort to take slot gaming to the next level with a bold and very surreal theme that will blow your mind. This 5-reel, 25-payline online slot game takes body parts of all different animals to create the symbols you will see throughout the game. The body parts have been morphed with the animal parts of mythological creatures that combine to make very bizarre animals and strange symbols. Symbols in the game include the Draconius Rex, Albus Slugus and Basilisk Pluma along with many other weird and wonderful animal combinations that take the meaning of the word evolution to a new level. The main feature in Evolution is the Evolution Bonus feature. This feature is triggered when you hit three or more free spins symbols across the reels. If you hit three free spins symbols across the reels then you will receive 10 free spins. If you hit four free spins symbols across the reels then you will receive 15 free spins. If you are fortunate enough to hit five free spins symbols across the reels then you will receive 20 free spins. As part of this bonus feature, you are also taken to a new part of the game which has a unique feel compared to the main game. If you thought the regular gameplay of Evolution was odd then you will be really thrown by this bonus feature part of the slot. The lower value symbols increase in value during this bonus feature and there is also the chance for you to win extra free spins. 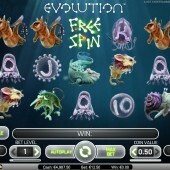 Evolution is all about the Evolution Bonus feature but it is a great chance for you to win big prizes. The game itself is very much in its own right when it comes to the theme. It is like stepping into the mind of Dr Zeuss and adding a gambling element to the equation. You will not forget this slot easily and it is a bit stranger than NetEnt’s other releases such as the fantastic geological themed Elements: The Awakening and the medieval themed slot, Robin Hood: Shifting Riches. However, that is what makes this game so special. There could be more bonus features but the potential reward once you hit the Evolution Bonus feature more than makes up for the lack of other ways you can win big.